SAN JOSE - The National Hockey League and the San Jose Sharks (@SanJoseSharks) today announced the team's complete 2016-17 regular season schedule. San Jose will open the 2016-17 season at SAP Center against the Los Angeles Kings on Wed., Oct.12. The 2016-17 season features 16 weekend dates, including Nov. 5 when the Pittsburgh Penguins make their only visit to San Jose in a rematch of the 2016 Stanley Cup Final. The Sharks visit Pittsburgh on Oct. 20. Click here to download the schedule to your calendar. Special matinee home games starting at 1 pm will be held on Nov. 25 (Black Friday), Jan. 16 (Martin Luther King Day) and again on March 11 vs. Nashville. The Sharks also play at 5:30 p.m. on Feb. 19 against the Boston Bruins. Fans can guarantee seats to each game for as little as $28 per game through a Sharks365 Membership. 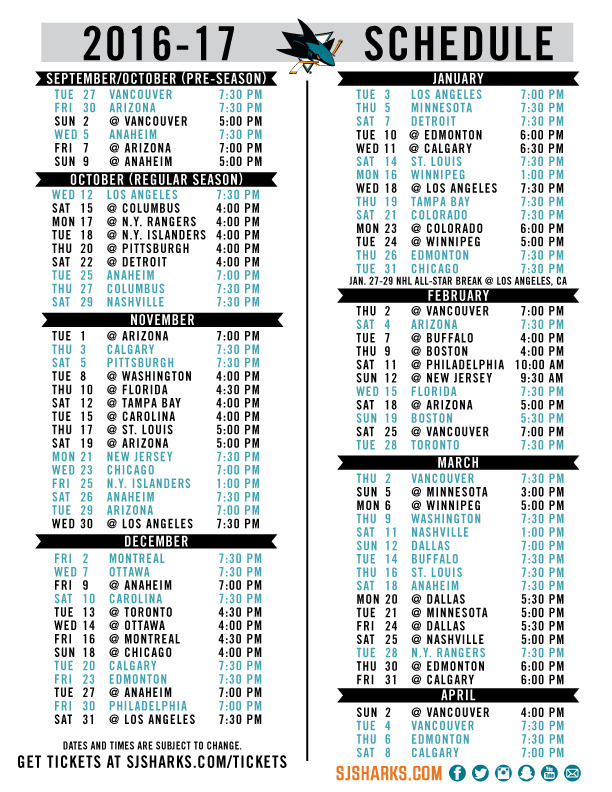 For an online version of the 2016-17 Sharks schedule, please click here.